AK’s book is clearly written. 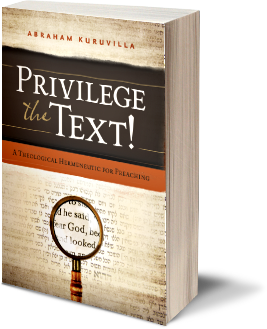 While it is far more likely to appeal as a textbook than as an accessible read for the pastor in his study, it is not difficult to dip into the book and get AK’s point. He also clearly has a longing for preaching to lead to transformed lives, as well as a passion for an increase in morality – all to be commended. AK’s exegesis of Genesis 22 gives a level of engagement with the text that is fascinating to trace through. It is a shame there were not more worked examples like this one (although the book would end up being prohibitively long). There are real strengths here, but I have to highlight some concerns with the theological assumptions evident in the book. View of God – The persistent recurrence of “divine demand” language presented a God who seems pre-eminently concerned with conformity to behavioural standards. It was not just AK’s choice of label, but the tone and content throughout that reinforced a very limited view of God. God is presented as a Father, but with the emphasis on our “filial duty of obedience.” Twice AK stated that his view of preaching is Trinitarian (pp 267, 273), but after studying the book I remain unconvinced that the richness of intra-trinitarian relationality substantively marks this work. View of Man (our nature, spiritual problem and solution) – At one point, AK states, “Philo was on the right track: ‘The proper end’ of man’s existence is ‘conformation to the likeness of God.’” (p261) Philo is known for offering a blend of Jewish exegesis and Stoic philosophy. Similarly, AK offers a blend of decent exegesis with an unquestioned commitment to a Stoic understanding of humanity. The approach to a so-called “divine demand” in the text supposes an autonomous self-moved moral impulse in humanity. Even accepting that the book is focused on believers who are “aided” and “empowered” by the Holy Spirit, the onus of their responsibility rests wholly on their own willingness to self-align to God’s preferred future. If AK’s vision of preaching were fulfilled, my feeling would be that believers would still be essentially distant from God – aligned to his demands, acting like Him, and living spirit-empowered moral lives, but what about union with Christ, what about being “in Christ,” what about the triune intimacy offered in the Gospel? I feel it is slightly harsh to reduce Johnson’s position to being “only informational and historical” and therefore without any element of moral instruction. I want to suggest that Bible texts are not merely informational and historical, nor are they primarily moral instruction, rather they are revelatory: divine revelation. The texts of the Bible reveal God to us, and in that revelation we discover the fullness of life (including, throughout, revelation of God’s values that shape our values and transform our lives into conformity with His holiness). However, we lose the heart of Christianity when holiness, loosed from a rich and delightful intra-trinitarian fellowship, becomes the primary emphasis. There are plenty of religions offering demanding gods and moral obligations. Only Christianity has a profoundly relational holiness defined by the delightful perfection of divine fellowship. A Strange Omission – I am perplexed at AK’s omission of John 5 in his evaluation of key Christocentric preaching texts – was Jesus not critiquing the seminarians of his day who looked for instruction, but missed the person being revealed? That seems like a passage that needs to be engaged in this discussion at some point. Conclusion – I can commend aspects of AK’s book, but the foundational theological assumptions raise many concerns. I find the implicit portrayal of God to be very restricted. I find the presentation of how humans function to be absolutely committed to an “autonomous self-willed” anthropology that resonates with Aristotelian and Stoic commitments, but seems to lack awareness of the full impact of Genesis 3. Sometimes it is hard to read a book and evaluate the underlying theological assumptions of the author. Sometimes it is easy to get drawn into the world as defined by the author and therefore find yourself going along with every proposal. In this case the theological assumptions were clear, and it was at this foundational level that I found myself struggling with the sometimes very helpful content. Who is God and what is He like? What is man and what does it mean to be made in God’s image? What is sin and the extent of the sin problem? And what is grace, the solution to the sin problem? These foundational questions should always be stirring us as we engage a book. Next time I post, I want to offer some alternatives to a Christiconic approach to preaching. Not to be reductionistic, but isn’t ‘Christiconic’ just ‘Moralism’ repackaged? That might be slightly harsh. I think that the author is seeking to hear the critique that a lot of preaching is not Christocentric, but struggling with how he sees some Christocentric preaching handling specific texts. Where he ends up is sadly close to moralism, but as I suggest in the review, this is more a fruit of theological assumptions than any guaranteed fruit from his commitment to close exegesis. Thanks for your reply Peter. I agree. I am just a bit concerned with all the critiques of RH because of the method observed rather than the principle. RH or Christocentric does not have to be loose with details. In fact, Vos, the father of Reformed RH was excellent at the details. Thanks Peter for this profound book review!